Blockchain may not be a household word yet, but over the next decade its impact on businesses will rival the transformative capabilities of the Internet. The potential applications of blockchain are endless, and for retailers blockchain will be revolutionary, write Cognizant‘s Steven Skinner and Lata Varghese. Blockchain creates a digital peer-to-peer network that enables direct transactions among users. Its distributed and immutable nature eliminates costly redundancy and enables trust, eliminating the need for and cost of an intermediary. Public blockchains, such as Bitcoin, are anonymous and open to anyone, while permissioned blockchains, such as might be found across a supply chain, comprise groups of connected stakeholders that have a vested interest in doing business together. Permissioned blockchains offer privacy, security and scalability and are well suited to the demands of an enterprise environment. Highly secure by design, blockchains provide enhanced transparency using a distributed ledger and public key encryption techniques that protect sensitive information while allowing verification and authentication of data by all of its users. In effect, this creates one set of books for the complex, global supply chain, enabling retailers to detail the entire transaction history of a product from source to sale without each retailer giving away control of its data and assets. Blockchain allows retailers to validate a product’s provenance and guarantee authenticity, helping combat counterfeit goods and reinforce the value of premium products. This is particularly important to top and bottom line growth as an estimated $461 billion in imported counterfeit goods hit the world market each year, according to the OECD and the European Union Intellectual Property Office. While there are many applications for blockchain in the retail world, its business value to the supply chain is most readily apparent and easily understood. Blockchains can leverage so-called smart contracts in the supply chain to execute actions based on a specified set of triggers, creating both controls and efficiencies. For example, when a retailer confirms receipt of a shipment on the blockchain, a smart contract might automatically initiate payment to the appropriate parties. Or, a smart contract could automatically trigger performance of an insurance policy when a sensor detects anomalies in a storage warehouse. Smart contracts might also be used to make procurement decisions based on a defined set of attributes, streamlining the procurement process. Building a transformational blockchain network can drive efficiencies across the entire supply chain, lower costs and counter-party risks through disintermediation, and improve customer relationships by providing indisputable proof of authenticity. Because blockchain adoption in the retail industry is a maturing technology, many executives question whether to act now or wait-and-see before jumping on board. A good first step is to define use cases for blockchain that address particular pain points or improve optimisation. From there, developing proof of concepts and executing pilots can help determine how, when or whether to unleash the power of blockchain across your organisation’s supply chain. Understanding blockchain’s implications to the industry now can drive future decisions about technology and allow executives to influence how blockchains evolve. 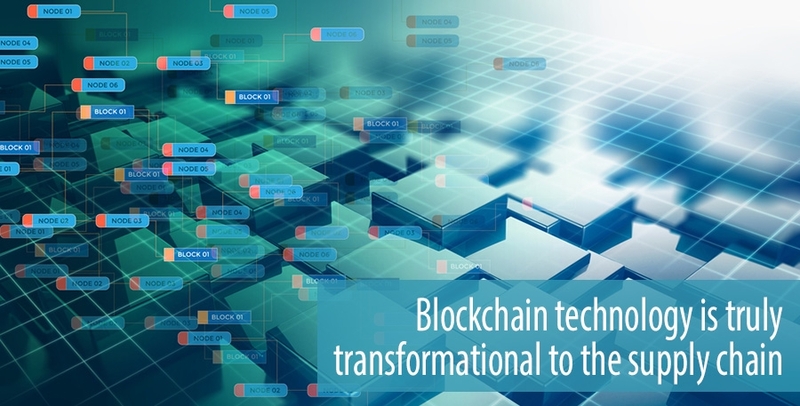 Those on the forefront will shape blockchain’s evolution to best suit the needs of their organisations thereby driving competitive advantage. Blockchain technology is truly transformational to the supply chain, and will require change on a cultural, technological, and business process level comparable to that of the Internet. Those that fail to embark on that evolution now may pay the price for late adoption.